Street art has existed for centuries, yet only recently have the scholarly efforts attached to the art form become recognized. Since the early 2000s, scholars from around the globe have begun to devote their entire careers to the academic study of street art. These scholars are pioneers leading the way in the study of street art, and this is why we have established the street art initiative. In this day and age we have reached a point in history where people from all countries and all backgrounds are paying attention to street art, where art of this kind is now a widely sought commodity represented by international auction houses and galleries and sold for record breaking amounts. As such, these efforts must be recognized. We believe in acknowledging those individuals who have devoted their lives to street art. We aim to connect them with one another and to build a cohort of international thinkers from various backgrounds and perspectives. This series is dedicated to those individuals and to the rise of Street Art Now. Since hosting the first retrospective of Banksy in 2014 Sotheby's continues to "[capture] on the momentum of street art's growing popularity. "However, the very involvement of a behemoth auction house, a capitalist institution, in what is historically a very public and controversial art form brings about many questions on profit, temporality, and accessibility. Each of these concerns manifests itself in the scandalous, yet oh so typically Banksy-esq, self-destructing canvas that appeared at the Sotheby's auction in London on October 5th. In a shocking turn of events, Girl with Balloon(2006)began to obliterate itself via a hidden shredder within the frame once auctioneer Oliver Barker had officially declared it sold. The next day Banksy posted a video of the incident on his Instagram account. Whether or not the auction house was aware of the spectacle is yet to be determined. But, a few things are certain. Both Banksy and Sotheby's benefitted from the event. Sotheby's has since received global exposure as the world continues to argue over whether this incident was a hoax, nothing more than a PR stunt, or a pivotal event of art historical significance. Creativity born from destruction, Girl with Balloonwas quite literally transformed into a never before seen artwork in front of a live audience. Banksy’s authentication body, Pest Control, even issued a certificate of authenticity for the new work of art. Half shredded and dangling from the bottom of the frame, the piece has now become Love is in the Bin. A multitude of factors point towards the involvement of the auction house despite claims that they had no prior knowledge of the event. There is also the question of only shredding the piece halfway. If Banksy’s agenda was to upset Sotheby’s and rebel against a capitalist system by effectively shredding $1.4 million in front of the wealthy few capable of attending such an auction, then why only shred half of the canvas? Half of the existing work is now estimated to be worth at least double the original sale price. No matter your stance on the issue it is nearly impossible to deny the genius behind such a daring move. With or without the inside help from Sotheby’s, Banksy turned the tables on a world-famous institution. Taking advantage of the auction, the element of surprise, and the swift moving current of the Internet, he cleverly increased the value of his work while simultaneously encouraging a worldwide discussion about profit and the temporality of his art. Future auctions that feature Banksy will no doubt be charged with anticipation as bidders wait for the next self-destructing canvas or some other mischievous and daring move. Widely known for his street art, this incident brings the artist full circle as he blurs the lines between traditional and non-traditional, questioning the separation of high and low art. Paint on a canvas is thought to be a concrete, stable, and reliable form of art. Yet Banksy has made it as ethereal as paint splashed across a wall, subject to instability and destruction. Through Instagram he has also challenged limited accessibility, bringing his art to the public and opening the doors to an exclusive million-dollar auction. Like all street art, the beauty of Banksy's shredded canvas comes in its ability to incite discussion, to begin tough and thoughtful conversations. Is Banksy a typical capitalist who has gone to extremes solely to increase the value of his work? Is he the epitome of anti-capitalism in destroying a symbol of money and power right before the eyes of those who treasure such symbols of wealth and luxury? Is he brilliantly doing both, simultaneously profiting off of and actively commenting on such a system? There is no simple answer, but he certainly has us talking. Sotheby's itself has consistently supported the rise of street art and valued the importance of this art form in sparking such discussions. They recently collaborated with the Movember Foundation, the leading men’s mental health organization, to present Against the Wall,a charity sale spearheaded by artist and gallery owner Dean Stockton, better known as D*Face. Sales will benefit the foundation's mental health programs. Nine artists such as D*Face, Shepard Fairey, Invader, Alexis Diaz, Okuda, Vhils, Felipe Pantone, Conor Harrington, and Jonathan Yeo have donated works to be auctioned off on November 20th. 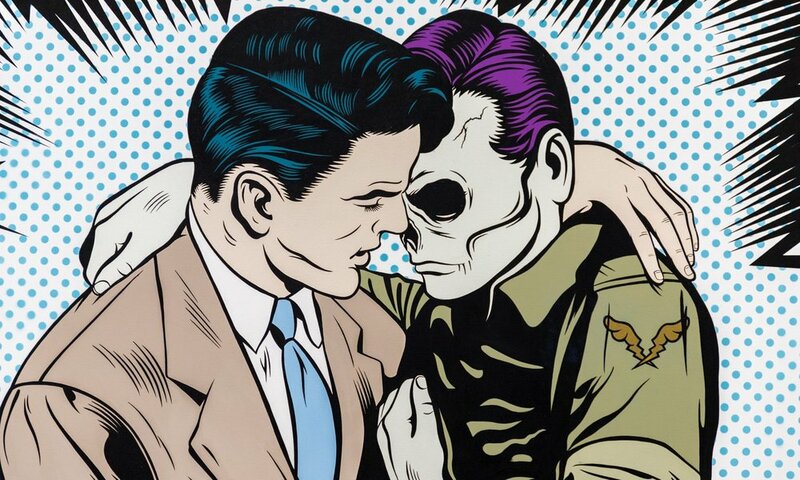 They will be on view from November 16th to the 19th and include works such as D*Face's Console the Lonely. This work embodies the spirit of the sale and encourages men to turn to one another for consolation and guidance in a society that has grown toxic towards the outward expression of male emotions. Carrying the slogan, “be a man of more words,” the sale encourages men to acknowledge feelings that are too often bottled up and ignored. These pieces will be included in Sotheby's next edition of Contemporary Curatedin London and will be sold alongside the likes of Andy Warhol, Richard Prince, John Baldessari, Tony Cragg and Andreas Gursky. The inclusion of these nine donated works with notable artists such as those listed above reflects the extensive growth that street art has witnessed and that Sotheby’s has supported. In December of last year Sotheby's Hong Kong held a charity auction which benefitted the Hong Kong Contemporary Art Foundation (HOCA) and featured 32 works donated by 29 international artists including Zevs, Invader, Shepard Fairey, Cleon Peterson, José Parlá, Vhils, and Zhang Dali, among others. It was an unprecedented sale solely dedicated to street art with final sales results that exceeded $370,000. An accessory to the growth of street art, Sotheby's has been aiding and abetting the rise of artists like Banksy who are just as likely to hoax the art market as they are to appreciate it. Whether they are shredding their own work in a performance made public or donating it for altruistic purposes, this is an art for the people, an art inciting change and discussion, an art defying boundaries with a momentum that Sotheby’s has embraced.